You can read below, or have me walk you through it with this video. There are Idaho counties with much less internet access than I thought! I mean, I knew this was a big challenge some places, but I didn’t think it’d be this bad. There wasn’t actually much difference in behaviors or perceptions across different age groups for these respondents. That surprised me. There were some exceptions though. 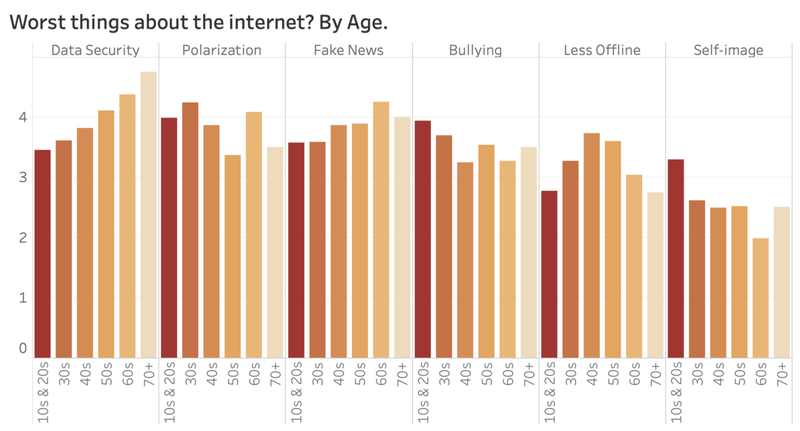 The biggest difference between age groups was how they prioritized “data security” in a list of the worst things about the internet. There was a nice, smooth trend showing that the older you are, the more concerned you probably are about that. Impact of not having access? 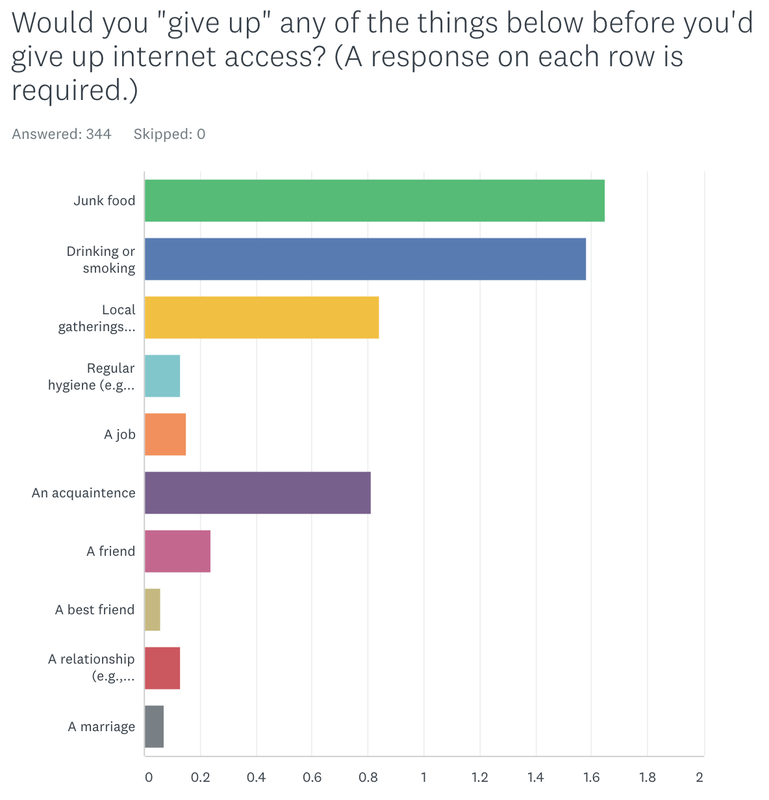 What would you give up before internet access? In our analysis, we take a deeper look at our survey results and highlight the patterns and insights we see under the surface using segmentation across meaningful demographics (like age, gender, and location). The internet connects people to the world’s information, no matter where they are, whether it’s about jobs, classes, news, tools, insults, friends and family, or cat videos. Online connectivity is increasingly becoming a requirement to participate in the modern economy and society, but not everyone has access, and that can be a huge disadvantage. Idaho leaders are looking for ways to address this, and we can help! 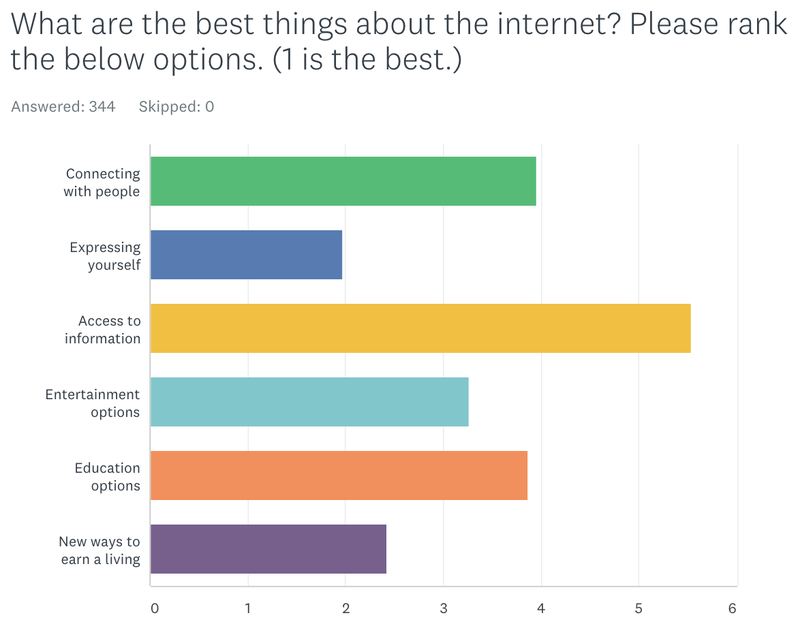 We wanted to know how you think about internet access. Whenever you look at survey results or findings, it’s a good idea to check the demographics of the respondents — that can have a lot to do with whether the results are likely to reflect a broad population, or just a niche group. This survey was distributed to our subscribers via email, through Facebook via targeted ads, and was shared by subscribers as well. We heard from about twice as many women as men, more middle-aged folks than younger and older, and more from Ada county than elsewhere. Keep that in mind as you check out the findings below. I wanted to start with some context. So, about the internet, how much do you use it? I wanted to get a sense of whether we’re hearing from total addicts (like myself) or occasional users. From our overall results, we can see that 75% of our respondents are using it “Constantly.” I’m definitely in that category. Interestingly enough, every single respondent is using the internet on a daily basis. I mean, I definitely think most people do that these days, but I thought we might have some folks that it didn’t apply to. Next, let’s look at how this broke down by age. 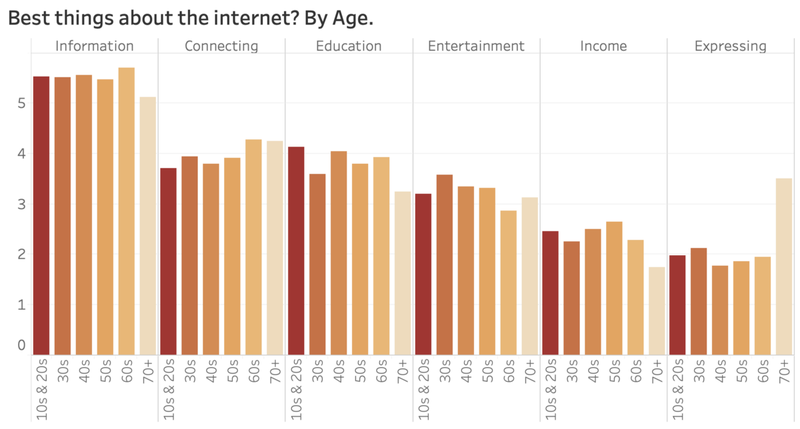 There’s a stereotype that younger folks use the internet more and older folks use it less. Let’s see if that’s born out by this group. Not really. 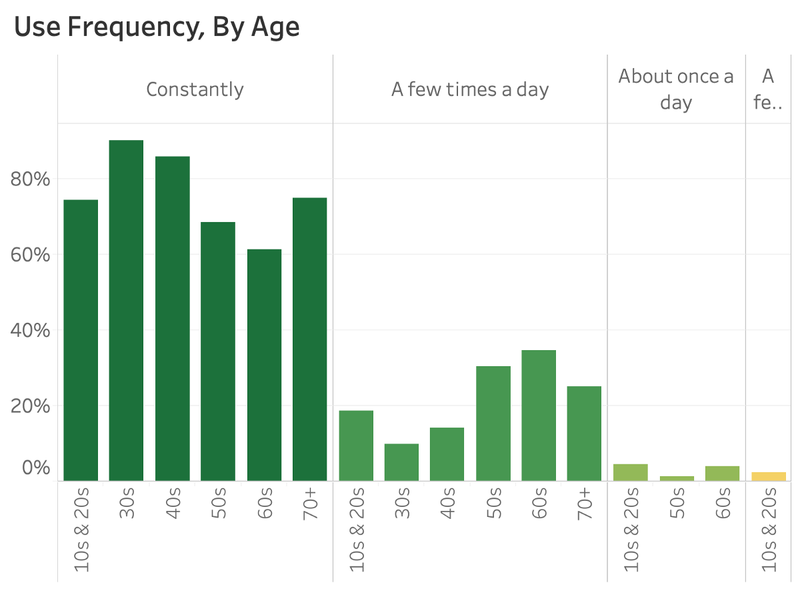 We’re seeing high proportions of all age groups using the internet “constantly.” But, we do see a bit higher proportions of 50+ folks in the “A few times a day” category. We definitely need to keep in mind that there’s some participation bias here. The people that saw this survey are online — that’s the only way to participate in this survey, after all. 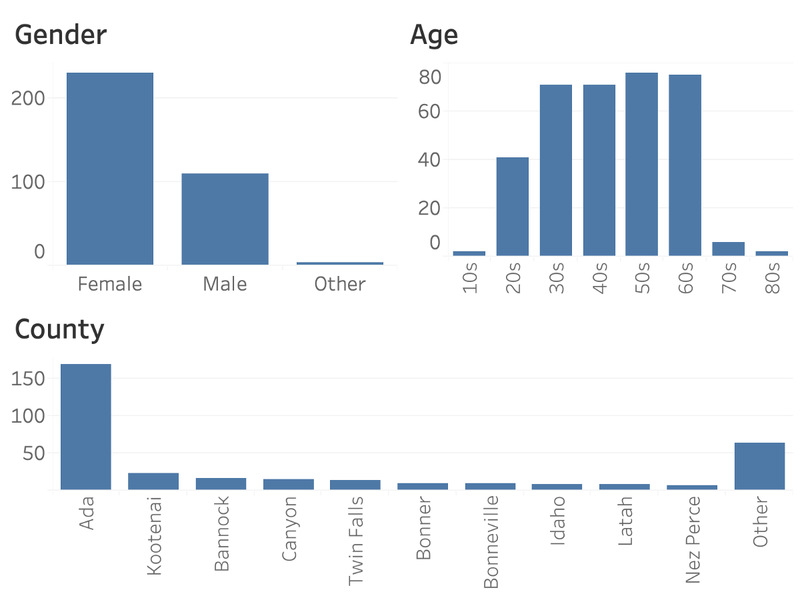 I’m guessing the “average” usage for some of these age groups across Idaho could be radically different. But that doesn’t mean this analysis isn’t valuable—I believe it’s better to learn about some people deeply than it is to learn about a lot of people shallow-ly (I’m going to make that word up; just call me Mr. Shakespeare). Alright, now let’s get a bit more specific. How do people use the internet exactly? Is it at home, on their phone… where? 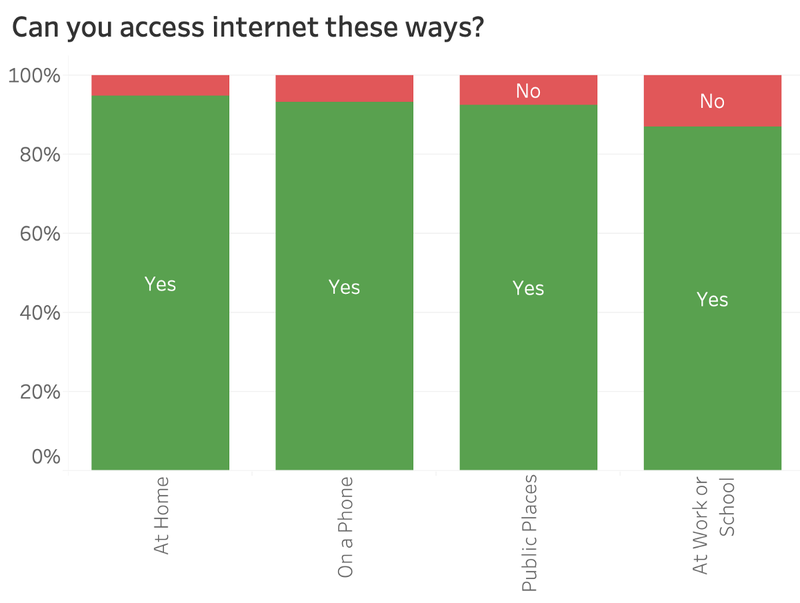 The weighted average chart in the overall results tells us that most of our respondents can access the internet in all these ways (home, phone, work/school, and public places), but work/school was the least available. I don’t really like that report view actually. Let’s break it down as a stacked 100% bar chart. Ok, this shows us the actual percentage of folks that have access or not in each scenario. 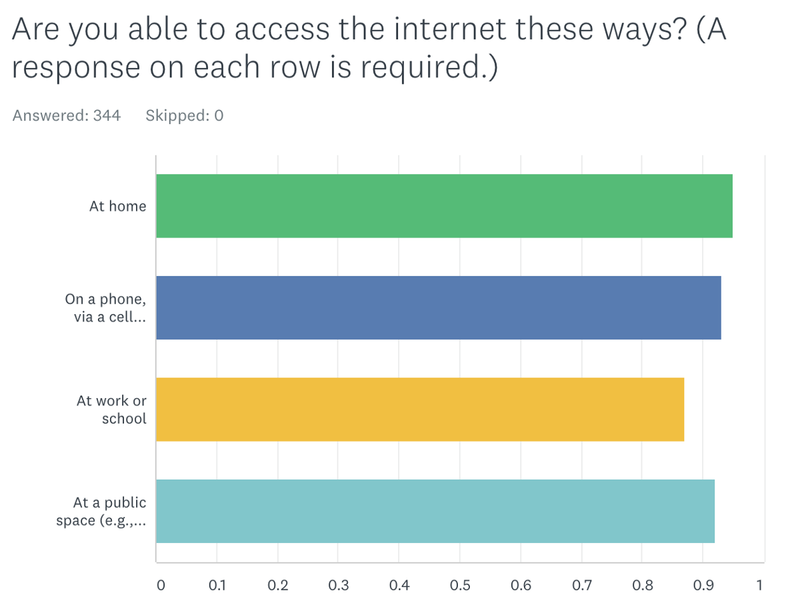 Looks like roughly 85% can access the internet at work or school. 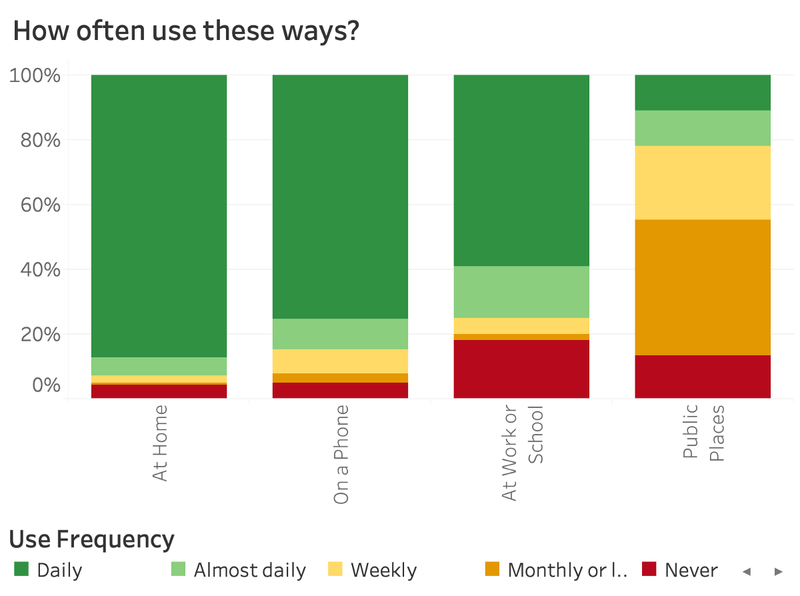 We know how often people use the internet, and we know which ways they can use it, but now let’s see how often they use them each way. Big differences on this question. Home is the most used, no surprises there. Then phone, then work/school, and public places last. Let’s go beyond this weighted average view again and see what the actual proportions look like. And it’s interesting that some people never access internet at home. But since we know that everyone’s using the internet on a daily basis, they must be using their phone for that primarily. Ok, this question was the actual reason for the survey. 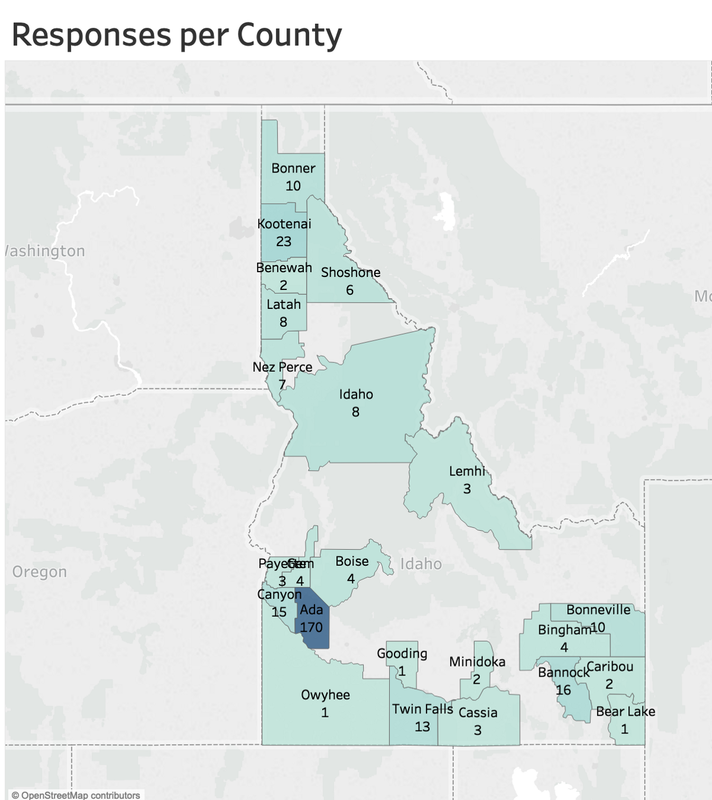 The Idaho Commission for Libraries is lacking good data on internet usage rates in rural Idaho, and this is really important for service delivery and resource allocation (and a concern regarding the 2020 Census, in particular). My suggestion was — let’s just ask people what their guesses are about their local area! Here’s the question where we did that. Again, this overall result as a weighted average chart (Survey Monkey default) isn’t that helpful. It basically only tells us how the categories compare, but not with specifics. Basically, we can see that the most access is available via a public place (sometimes a library is the only option), and then home is the second. 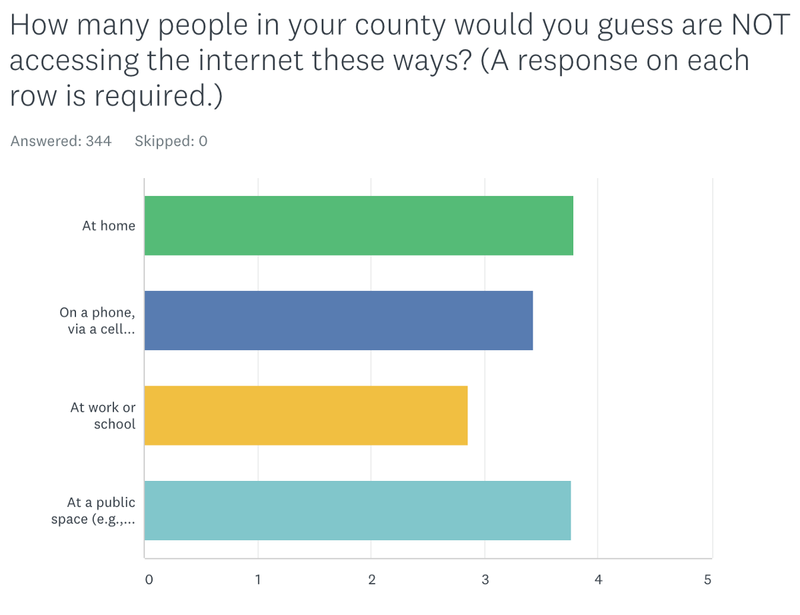 Let’s break it down by the actual answers of how many people each respondent estimated are not able to access the internet these ways in their county. Wow! This view shows us the results are totally across the board. There are almost equal numbers of people responding that 5% or less aren’t accessing as there are people saying 30% or more aren’t accessing. I think the only really helpful way to look at this is from an county average view. Let’s do it! Wow! BIG differences across counties. We’ve got some pretty red counties (low internet access), but several of them don’t have more than a few survey responses coming from there. I think that makes the locals’ estimates less believable, in some cases. The most concerning counties to me are the ones with high not-accessing rates, that also have more than a couple responses. Bonner, Bingham, Nez Pierce, and Idaho counties look like they might be having the worst access issues. And a lot of counties aren’t much better off, from the way these estimates look. Ok, now let’s put this in perspective. 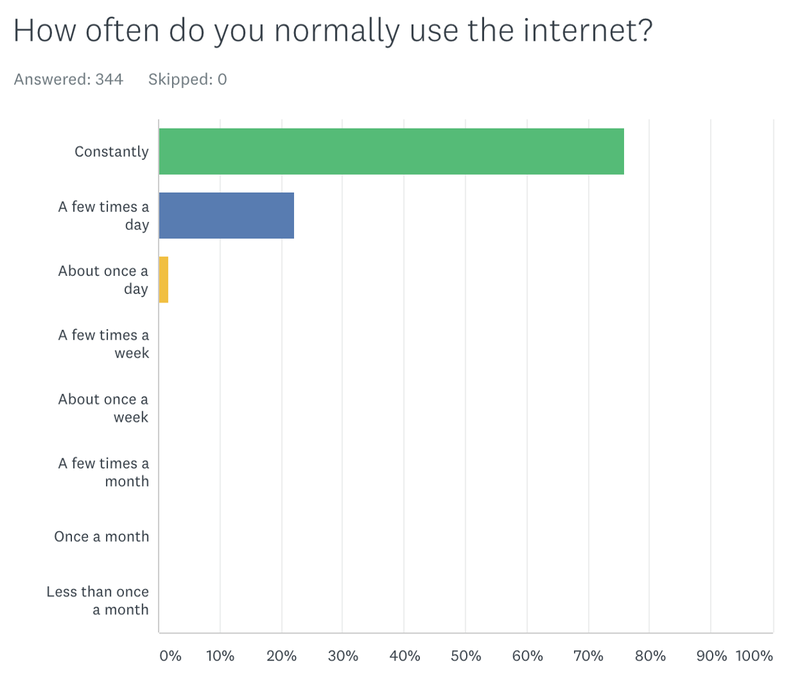 I wanted to know how big of a change it would be for our respondents to not have internet. I know I freak out when this happens involuntarily for any length of time. I want to look at this by age. 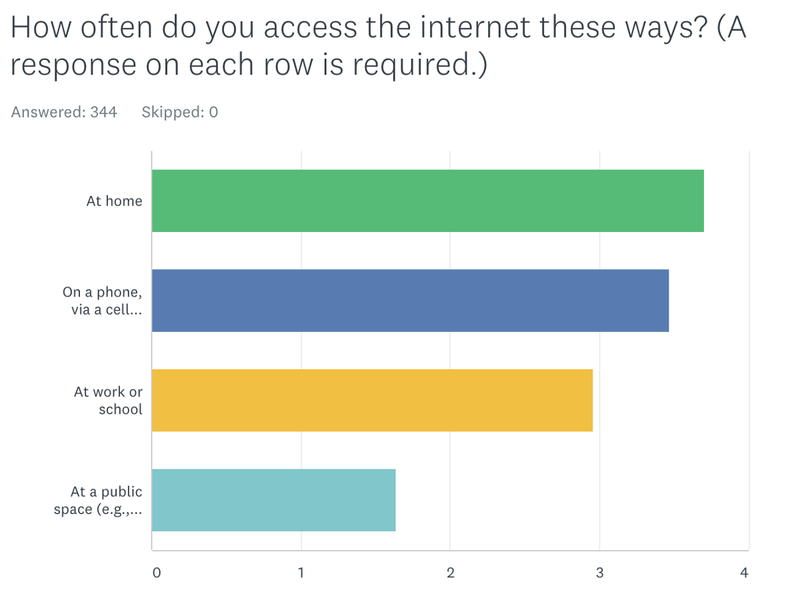 I know there wasn’t a big difference in how often our respondents are accessing the internet based on age, but perhaps older folks would feel less dependent on it — many of them lived without it for a long time, after all. I think that theory seems plausible, from this chart. The smooth upwardly increasing trend in the “A lot” category is what I’m looking at here. It appears that a greater proportion of people don’t freak out as much about not having access when they’re older. Now, let’s get more specific with some fun hypotheticals. Most people said their lives would change dramatically without internet, so I wanted to know what tradeoffs they would accept to keep it. In other words, what would you “give up” before you’d give up internet. Things almost no one would give up. But some would! Things like a job, regular hygiene, and a marriage are in this category. Less than 5% of respondents said Yes to each of these. But we did have Yeses on every category! Let’s dig into the local gatherings one — it’s particularly intriguing to me. I feel like this relates to the classic complaint of “You’re online so much, you’re disconnected from the real world.” It basically sounds like half of the people would give up group activities in the “real world” before they’d give up their internet. 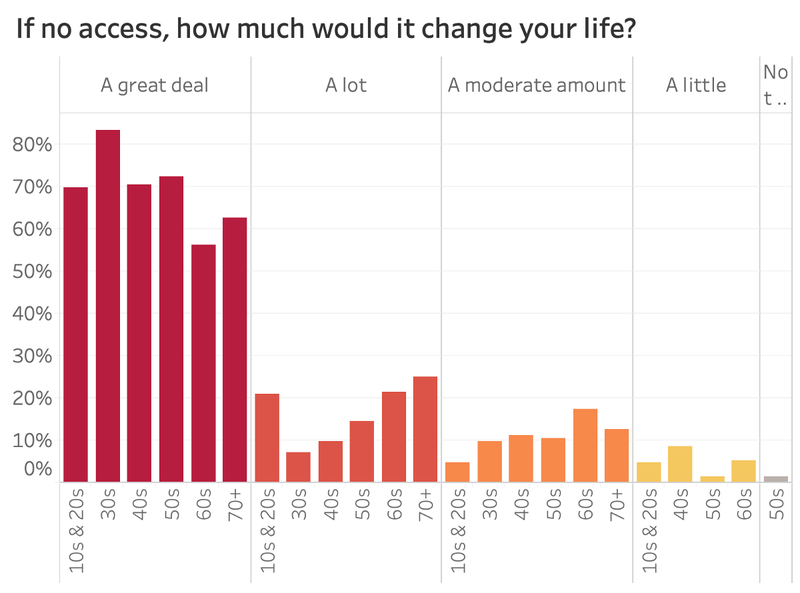 By age, it looks like maybe 60+ folks are the most likely to accept this tradeoff. 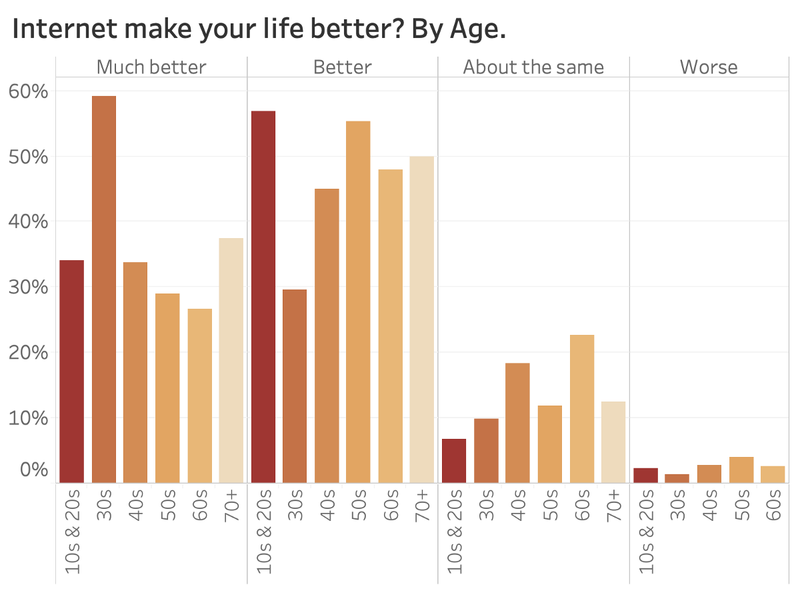 This isn’t really what I expected, because I’ve often heard this comment from older folks in the past… But then again, these respondents are probably some of the most connected older folks. 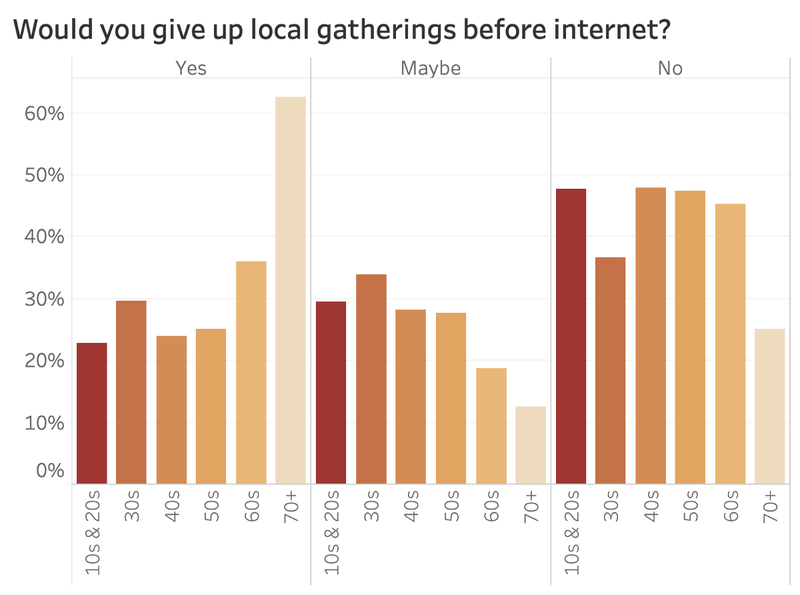 Also, one interpretation might be that some people generally get less connected to their communities as they get older, and if you’re already not really going to local gatherings, it wouldn’t feel like you’re giving much up to make that trade. Now, let’s get reflective. There are a lot of good things about the internet (and bad; that’s next). I wanted to know which things people think are the best. 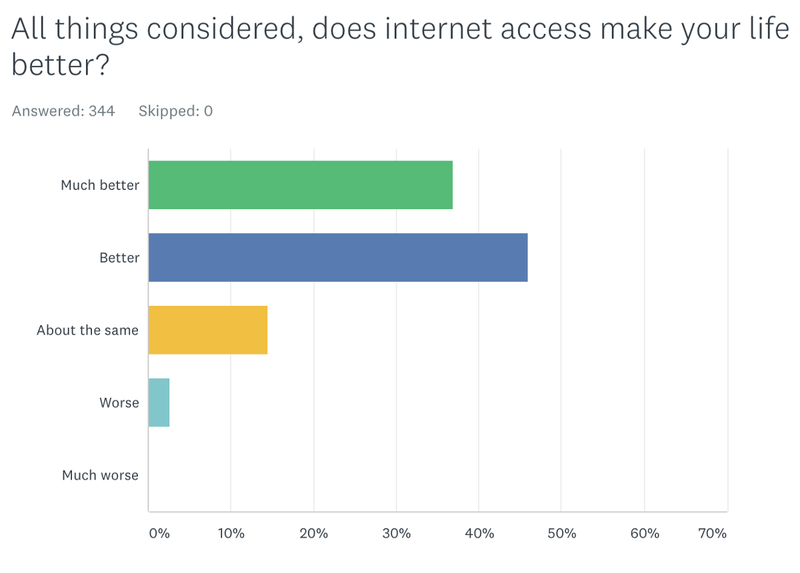 From our overall chart, we can see a clear winner — “access to information.” This is definitely the foundational ability of the internet, and arguably it’s what enables all the other things. I concur. It was interesting to me that “Expressing yourself” was so much lower than the rest though… I would have expected it to be quite a bit higher. Let’s go back to an age breakdown to see if anything interesting pops out. Eh, not really. I think the only thing noteworthy here is that the 70+ folks seemed to like “Expressing yourself” more than the other age ranges did. Let’s look at the other side of the coin now. 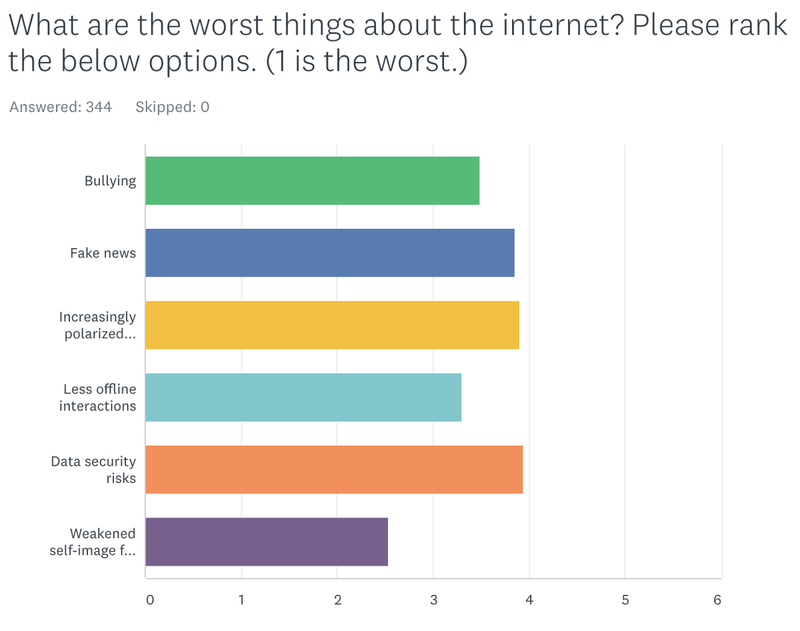 Which things do people think are the worst things about the internet? There wasn’t really a clear winner on this question, like there was on the last one. There are a clear Top 3 though: “Data security risks,” “Increasingly polarized viewpoints,” and “Fake news.” And “Weakened self-image from comparisons” was considered the least bad thing overall. Let’s go back to age differences now and see what we find. Whoa! There’s something good in here — look at the smooth upward trend between “Data Security” concerns and age! It’s rare that exploratory data analysis will reveal such a pretty trend as this. This definitely passes the sniff test for me. I’ve experienced a lot more concern with data privacy, security, breaches, and hacks from older folks than from younger. If I can generalize, I’d say that older folks generally go bat s**t crazy over that, and younger people are like “meh.” My anecdotes seem totally backed up by this chart. Ok, given all that we’ve covered, I wanted to know if people consider the internet to make their lives better. Basically, 👍 or 👎. Almost no one responded negatively (<5%). The most popular answer was “Better” (45%) rather than “Much better” (35%), and I interpret that to mean that people have some reservations (there’s both good and bad), but they’re definitely grateful to have it. Now, we might as well check age, one last time. Not a lot to call out from this view, I don’t think. If anything, I’d say that the 10s & 20s group were the least negative. That jives — Millennials and Gen Z are the “digital natives,” after all, and we don’t have much experience without internet (or any, depending on who you are). It’s almost like using electricity. That’s all for quantitative analysis. Now, we’re going to shift gears to qualitative, and see what insightful comments came through. Fake news. I am so sick of hearing that phrase. In middle school, we did a unit on how to make sure your sources on the internet are credible. I think a lot of people need a refresher. Data breaches, at this point everyone should assume their information has been compromised. The concept that it is a luxury, not a modern necessary utility like water/electric/telcom/gas. Why is our government concerned about whether people have access to it? If people want it, they’ll get it. If they can’t afford it, hopefully they have friends who can, and there’s always the public library anyway. The internet is a tool. Before the internet, we got our news and information from magazines, newspapers, and TV. Few people went to the library to check on the accuracy of what they read or heard. Too many people treat what is said on the internet in the same manner. If it is out there, it must be true. Yet, we have the library at our fingertips with the internet. All the “bad stuff” that comes with it. Cyber bullying, unhealthy comparisons, lessening face-to-face interactions. These things only happen if the user lets it affect them. There is a lot of good that can come from internet access if you get past the bad parts. People’s feelings and opinions on facebook. If you disagree with someone, there is no need to argue. Respect differing opinions and move on. Privacy and data — you have to take an active role in protecting yourself! Companies have a responsibility too but cannot be 100% responsible for people. Using it so much there you stop interacting face to face. SM [(social media)] is an incredible community for people living with disabilities or other groups that have isolation. Controversy of the day: often presented as bombshells, but a week later, we’ve moved on and the old one didn’t matter after all. The purpose is really consuming attention and stoking emotion, not informing, educating, or helping anyone. It’s as if we’ve become a nation of tabloid readers instead of citizens. “Political polarization.” The United States has always been politically polarized, and should continue to be until a whole litany of things in our society change, namely: white-supremacy, misogyny, class-exploitation, and our incredible disrespect for our natural environment. The internet is a great tool for learning more about these things if used correctly, but people tend to focus on “polarization” as this huge social ill. I wish people would read more — and the internet is a great tool for that. Bullying. Has always happened, the internet is just a new way for bullies to access their victims. The root of the issue should be addressed. The internet is an easy target for this problem but it’s not the root issue. The negatives. Social media and fake news charlatans have certainly proven themselves to be harmful to society, but the importance of the ability to access and share information instantaneously across the globe cannot be understated in terms of its benefit to business, government, public health and maintaining personal connections. Too much emphasis on providing students with internet use in schools. Kids will figure out computers and internet use; we don’t need to teach them how to stare at a screen during class time in the lower grades. I think there has always been misinformation and the “fake news” issue is being blown out of proportion. If you are a critical thinker you will not be fooled. People share too much about their daily lives, and that bleeds over into offline content. Bigger towns get 3 time the speed as rural and some rural places have no internet access. Filtering of internet in public places. The legislature needs to leave libraries and other public access points alone. Let them develop their own policies and police their own people based on their needs and available resources. People watching other people online and thinking they have a wonderful life. Then forgetting to live their own life. The “negative effect” of online friends/interactions. If people can find a place where they are wanted and can make friends, this is a good thing. So-called polarization. Certainly, there is data to back up that the country is in fact, more polarized than ever before. But is the internet actually making us more polarized, or is it just that we are more aware of other people’s views? Maybe it was “better” or “easier” for you to live your life when your Uncle’s racism was only on display at family gatherings instead of popping up in your FB feed. If anything, the internet has presented you with an opportunity to do something about this. So maybe you should. The 24 hour news cycle. We have constant access to everything happening at once and I feel like we focus on every tiny thing and have no prioritization of news and information. Personal responsibility and individual control. We choose how to use this tool. It cannot be used passively against us without our participation in most cases. We need to learn to moderate ourselves and use it responsibly. Insufficient bandwidth to actually offer Idaho citizens suitable opportunities to grow, learn, and move forward with career options. People are the root cause of just about every “bad” issue online. Unfortunately, the web fosters poor relationships between people because it can be so impersonal. It’s easy to say negative things with the recipients or readers aren’t “real” or face to face. Being MIA from physical conversations and interactions. People are turning into zombies with non-existent attention spans. Internet is now the medium for all communication. Without it you effectively turn time back a century — to a time that also didn’t have electricity or indoor plumbing. Think about it. How much we take it for granted. Not everyone has access to it, not just globally, but even here in Boise. And in a time when there are specific country’s who are placing limits and filters on their public search engines goes to show how valuable our freedom of access truly is. So we should appreciate it for what it is- a privilege, and stop abusing it by posting fake information, spreading polarizing stories, and damaging people. Too many school children do not have access to the internet, particularly in rural areas. It is our duty to teach children and young adults how to use this tool wisely, yet some do not get the chance. Perhaps because of this lack of education, cyber-bullying has become epidemic. The distance between the bully and the bullied that the internet provides creates a perfect platform for the bully. S/he can write anything, but never have to come face to face with her/his victim. Rural Idaho communities still don’t have reliable internet service! This needs to be fixed! Because internet has become so ubiquitous, there isn’t enough attention paid to the people who don’t have access. Also, internet monopolies (or near monopolies) can really influence access, in my opinion. How much it is now needed for daily life — job apps, access to resources, filling out forms for food stamps, work, schools (even elementary) require students to access for homework, etc. It should be a publicly controlled utility. In addition (because nowhere else to add this), the Statehouse keeps trying to require mandatory filtering in public libraries, without understanding how filtering (doesn’t) work, and that it would be a huge cost to already underfunded rural libraries. It would be an undue burden and unfunded mandate and be a barrier for many in the community who come to the library to research in a judgement free zone and safe space, whether it is custody law, breast cancer research or seeking LGBTQ allies (to name a few examples). The fact that internet service providers (ISPs) are running near-monopolies and can do whatever they damn well please thanks to the (horribly misguided) repeal of net neutrality laws. That people and society are increasingly losing the ability to function without it. This turns into a resiliency issue as well as a justice issue. The fact that the internet is so easy, and often free, to access that nearly anyone who doesn’t have access only doesn’t because of their own choices. Most importantly, that the government has no business providing or subsidizing personal internet access. MUNICIPAL INTERNET! We 100% don’t need our internet access governed and gouged by two private companies (cableone and centurylink). The treasure valley as a whole and most of rural idaho would benefit greatly from community-provided access to the internet, which could be cheaper, more reliable, and an actual source of economic growth. There are probably things around responsible use of the information and proper interactions with people in social media, once you get access, but that isn’t really about having access to internet. I think one other question I have (so maybe leaders aren’t making it clear enough) is what is so hard about getting internet access to Idaho Rural areas? I am sure I am being too simplistic about a complex problem, but it seems like it wouldn’t be as difficult as it is. So what is the hang up? It is often assumed by large corporations and services that everyone has access to broadband. We have very slow Internet where I live and a lot of services I pay for (HBO for example) do not work well in my home. It is not that I cannot afford fast Internet, it simply is not available for me to purchase. We don’t get reliable enough internet access in LEMHI County to say we have it. We pay CenturyLink the ONLY option outside of town but do not receive adequate service. Not enough attention paid to rural infrastructure companies not willing to upgrade systems. Not everything it true on the internet. In Idaho we pay more for less internet access. Our home doesn’t get the speed that others do and I pay more for what I get. This makes it harder to work over the internet. Also phone based internet is spotty to non-existent when I leave town. Real options for access in Idaho. There are only two options for access and one is slow the other is priced ~2x market rate for any real speed and a reasonable data cap. Monopolization of search engines, social media, creating huge corporations that no one can compete with and destroying democracy. The increase in access to a smartphones, and in particular, use of smartphones as one’s “home” internet, have helped to close the access gap. But cost of data and other issues can still make that access unreliable. 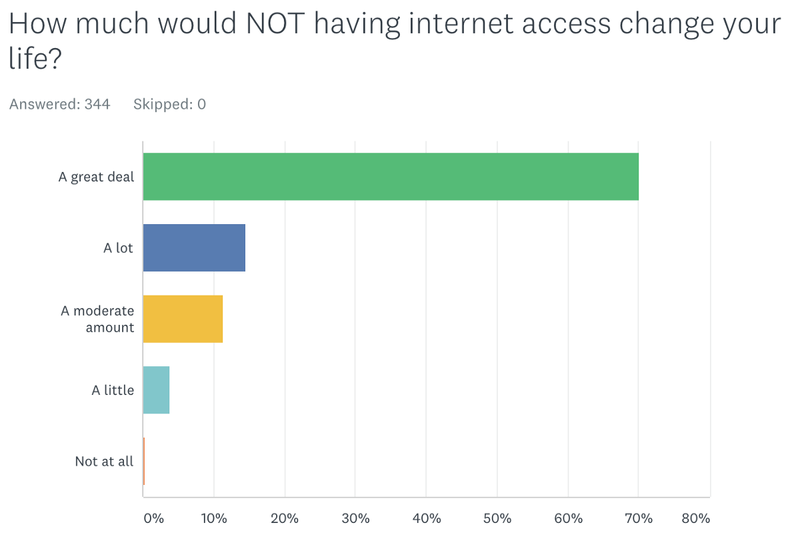 While some Americans may have the choice and privilege to not be online because they actively do not want to be, that’s not the case for the majority who are still without reliable access. Not being online can be an impediment to learning, to finding jobs, and to using government services. Local, state, and federal government increasingly require internet access for the public to connect with services. If the government is going to require internet access for the people to interact with the government, government should provide this service to the people. The fact that internet should be provided like city water or sewer. Not forced on everyone, but offered to everyone in a government district and held to a minimum standard of performance while the cost is regulated. The high cost is too much for most families, and the stability of connection in this area. The ability to be unbiased. Those who surround you are the only people you can get information from in person, but online you can find countless viewpoints from others. Kids shouldn’t be able to freely access the internet unsupervised until they are 18- school shouldn’t make kids have homework where they have to have the internet to finish it. Some places in our area do not have internet that’s not fair to those kids. It’s easy to think everyone has equal affordable access but rural isolated communities don’t. Our affordable internet is too slow to work remotely.